Rev. MYRON A. MUNSON, M. A., A great-great-great-great-great-great-grandson of Capt. Thomas Munson. I congratulate you, admirable and esteemed cousins, upon the dawning of our Quarter-Millennial. Arise we and with reverent hands break the seal and roll away the stone from the mouth of the family sepulchre. This day is the resurrection of the name and the Salutatory. . fame our greatest grandsire, Thomas Munson. With him, at his august beck, step forth from their shadowy habitations in God's-acre sterling sons and delectable daughters by thousands, smiling and glad though serene, to join with voiceless fellowship and silent rejoicings in our commemorative and congratulatory festival. Half a thousand minds are eagerly inquiring: What was the origin of our venerable originator? He suddenly emerges from silence and darkness,—his antecedents as mysterious as those of the lightning's flash. He Our Adam. .was never born,—so far as history knows. Do we not conceive of the Adam of the human race as about twenty-five years of age at the moment of his creation? In a similar manner the Adam of our family, without any antecedents or any nativity, suddenly makes his appearance on the stage of life, like a new creation, at the age of twenty-five. This first appearance was at Hartford, by the Indians called Suckiaug, two hundred and fifty years ago last May, and he is already accouted as a soldier, about to engage in a war as pregnant with momentous results, it may be, as any which has ever been waged. At that period the region from the Atlantic ocean to the Alleghanies was one vast, solemn forest,—a paradise of war-paths and hunting-grounds. The throne of Indian power was among The Five Nations, of central situation New York,—usually called The Mohawks, from 1637- confederate which enjoyed the supremacy. Proud, warlike, vehement, irresistible, their name was a terror to all other red-men. 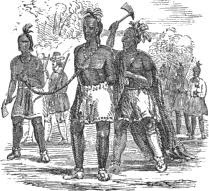 Every spring, two old Mohawk chiefs might have been seen going from village to village through Connecticut, collecting tribute and haughtily issuing orders from the great council at Onondaga. 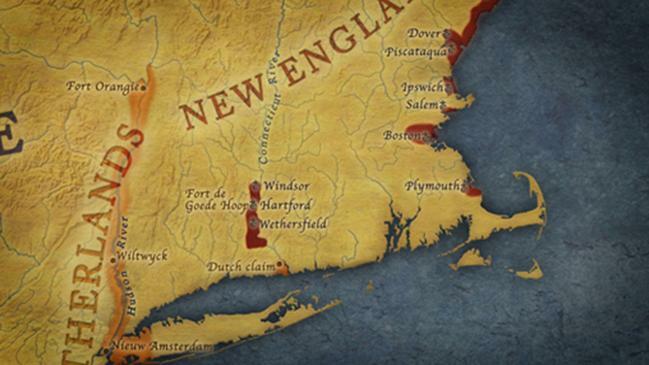 The number of Indians who were occupying the territory now known as the State of Connecticut has been very diversely estimated at from six or seven to twelve or twenty thousand. These estimates imply from 1200 to 4000 warriors. It is conceived that one-half of these may have been Pequots, whose forts and wigwams extended along the Sound some thirty miles. The Thames, on which New London is situated, was then called Pequot river, and one of the two great forts of the nation—the one at which the historic battle occurred—was located eight miles northeast of New London. The Pequots were the most ambitious, the most valiant, the most fierce and the most powerful by far of all the communities eastward of the Hudson. They were a terror to all the wide reaching wilderness around them: they were to New England what the Mohawks were to the whole country eastward of the Mississippi. To them, as well as to the Mohawks, the Quinnipiacs of this neighborhood paid tribute. Such was the Indian situation in the spring of 1637: what was that of the Colonists? Hartford was two years old; north and south of it, adjoining, were Windsor and Wethersfield. Twenty-six miles north was Agfa Colonists' situation wam, one year old; we know it as Springfield. Sixty miles below Hartford,—forty-six as the crow flies,—at the mouth of the river, on the west shore, was Saybrook fort, one year old. These five infant settlements were the only habitations of white men in all the Connecticut valley. Their neighbors were about a hundred miles distant, and mind you these were roadless, wilderness miles. There was no New Haven, Milford, Guilford, Middletown, Waterbury,—but, rather, Quinnipiac, Wepowaug, Menunkatuc, Mattabesett, Mattatuck. The Bay State had no Westfield, Northfield, Deerfield, Hadley or Northampton,—but, instead, Woronoco, Squakheag, Pocomptuck, Norwottock and Nonotuck. Accordingly when trouble arose with the Pequots the aspect of affairs was extremely serious. The white settlements could muster two hundred and fifty or two hundred and seventy-five men capable of bearing arms; there were 5000 Indian braves within easy marching distance of the mouth of the Connecticut. Endicott's expedition, calling the Pequots to account for murders, converted that nation into a gigantic hornets' nest. Killing whites became their recreation. Several at Wethersfield were assassinated and two girls were ( carried into captivity. The savages, dressed in the clothes of the English whom they had murdered, would approach the fort at Saybrook with defiant jeers: "Come out and get your clothes again!" and they would mimic and mock the prayers and shrieks and groans of the wretched colonists whom they had tortured. Great was the distress of the settlements. A cunning and ferocious enemy haunted them and hunted them day and night. Ninety men, of whom forty-two were furnished by Hartford, descended the Connecticut under the leadership of Capt. Mason, and sailed eastward past the Pequot country to the vicinity of Point Judith: seventy- seven men disembarked among the Narragansetts, took up their march westerly, and, at daybreak on the 5th of June, surprised one of the hostile forts—a palisade on a hill, enclosing about an acre, and embracing seventy wigwams. A dog barked—a Pequot yelled, "Owanux! Owanux!" In rushed the lion-like pale-faces and engaged in a desultory, heroical warfare. At length, in desperation, the commander seized a fire-brand and applied it to the dry mats with which one of the rude dwellings was covered. Several hundred of the Pequots perished by the musket, the sword and the conflagration, and only seven escaped. While the victorious army was retreating, three hundred warriors, dispatched by Sassacus from the other fortress, rapidly approached until they beheld the smoking and smouldering ruins which were the crematory of their brethren ; then stamping and tearing their hair, they rushed down with great fury upon the conquerors. They were promptly repulsed, with a hundred slain and wounded. It was in this terrific war, pregnant with inexpressibly momentous consequences, that ThomasMunson made his first appearance, two centuries and a half ago; and he was preeminently a military man during the forty-eight years which followed. You may note, if you please, that our spirited and intrepid soldier received an allotment in the Soldiers' Field, (on the northern margin of Hartford,) in recognition of his meritorious services in this war, and that he was subsequently presented with an additional hundred acres for the same cause. We have recognized that Hartford was two years old at the date of the Pequot war; whether Soldier Munson had been there from the beginning, as is most likely, we are not informed. He had probably spent some months or years in the older towns about Massachusetts Bay; but we lack light upon the subject. Boston, at the time of the war, was seven years old; Salem, nine; Plymouth, seventeen. In respect to his transatlantic history there is nothing known with positiveness. Traditions have come down, along numerous and widely separated family lines, that he had some kind of connection with Wales; and it is the only tradition concerning him which has any value whatever. In some way his early history acquired a Welsh tinge. But there is no doubt of his English nationality. The Monson race belonging to the peerage has a known and accepted history of five hundred years; our American history extends back one-half that distance; the presumption is almost a certainty that our branch is from that ancient trunk. Lord Monson, Aide-de-Camp to the Queen, concluded his fourth letter to me, u March, 1887, in this graceful way: "With best wishes for the welfare of my Transatlantic Cousins and for the success of your Autumnal gathering." A brother of Lord Monson, Sir Edmund, Her Majesty's Minister to the King of Denmark, wrote from Copenhagen, July 24, 1886: "When I was appointed Attache to the British Legation at Washington, in 1858, my Father, Lord Monson, . .
. . was very anxious to know the subsequent career of the Monsons which had emigrated to America in the Seventeenth Century." Sir Edmund observes again: "I have little doubt that our common ancestor was a Dane." Turning from things obscure, let us return to what may be known. Our forefather was born two hundred and seventy-five years ago, somewhere, and two hundred and fifty years ago was a pioneer of Hartford and Hartford participated in the Pequot war; after the war, he continued to reside in that plantation a little more than two years, apparently,—having a house-lot comprising two and one-half acres on the present High street, opposite the head of Walnut: this street was then known as "the highway leading from the Cow-pasture to Mr. Allen's land." There was a house on this ground in February, 1640, which was probably built by Munson. Previously to this date he had sold the place to Nath. Kellogge, and he had also sold his portion of the Soldiers' Field. Two parcels of land, on opposite sides of the Connecticut river, had been forfeited by his removal from the plantation. In 1639, at the age of twenty-seven, Thomas became a pioneer of New Haven, then known as Quinnipiac. The settlement was begun the preceding year. The beginners had laid out a town-site half a mile square, having its base, on the south, parallel to the West Creek, and having its east side parallel with East Creek; both of these arms of the sea were navigable. The town-plot was divided into nine equal squares, of which the central was called the Market-place, square designed for public uses; it is the famous Green, upon which we are now assembled. Each of the eight streets was called "the towne streete "—having no distinctive name, and at the end of each there was a gate. In the Market-place the military forces were drilled, and here they assembled when an alarm was sounded. Here was the watch-house, the head-quarters of the night watchmen. Here were the other public buildings,—and especially the public building called the Meeting-house, which was the sanctuary where all worshiped, but also the town-house, court-house, state-house, and, to some extent at least, the arsenal. "The Church of Christ in New Haven," which was the only ecclesiastical organization within the limits of the present town during the first one hundred and four years of its history, still survives and has opened to us its hospitable doors on this occasion. The "Proprietors" purchased lands from the Indians with a common fund, and there were nine "divisions" of different sections of the so-called common-land, extending over a hundred and twenty years. The amount of land each proprietor received in the distribution was determined by his investment in the common stock, the number of heads in his family, his official dignity, and other considerations. The size of the house-lots in the town-square was similarly determined. To certain settlers who did not contribute to the common stock "small lots" were granted,—most of them along the West Creek, opposite the town-square. Such "planters" also received limited allotments of land in the second "division,"—" layd out beyond the East River betwixt our pastors farme and the Indians wiggwams." you were entering this sanctuary. The colony was created in June, 1639. It was ordained that those not present who were to be "planters," should subscribe this " Fundamental Agreement," as it was called, with their own hand; and so it comes to pass that we have the autograph of Thomas Munson, which is sixth in a list of forty-eight. The first definite date touching Thomas Munson's history as a New Havener is April 3d, 1640, when the court ordered "thatt brother Andrewes and brother Mounson shall veiw the grounds of difference betwixt Mr. Malbon and Thomas Mouleno1 the elder." This appointment was complimentary to "brother Mounson" as a new-comer, and only twenty-eight years of age. And now, patient seekers for knowledge, we have somewhat tediously worked our way through the fogs and snags and sand-bars of the subject into an open sea where fair sailing rewards us. The private biography of our ancestor, as known to us, is very brief. As early as 1640, he received one of the "small lots" on the south side of George Street, along the West Creek. Eleven years later, intending probably to remove to Delaware Bay, he disposed of his lot together with a dwelling house, barn, shop, hen-house, garden and trees. His residence the next five years is unrevealed. In 1656, he bought the lot on the southeast corner of Elm and Church streets, opposite the Green, where the "Blue Meetinghouse" afterwards stood; just below, on Elm street, were the habitations of Mr. Davenport and Gov. Eaton. Six years later he purchased the place formerly owned by Robert Newman on Grove street—now bisected by Temple street. This was his home during the last twenty-three years of his life. His neighbor eastward was Andrewes, the ex-innkeeper; his neighbors westward were Benjamin Linge and his life-long guest, Col. Dixwell, the regicide. Capt. Munson's home was afterwards owned by his son and three of his grandsons successively; and in more recent times Noah Webster, the maker of dictionaries, had a residence on that ground. Thomas was the father of three children: Elizabeth, the wife of Richard Higginbothom, a tailor, who removed to Elizabethtown, N. J., and thence to Stamford; Samuel, to whom we shall return later; and Hannah, who married Joseph Tuttle. We know little of the domestic animals which added animation to the home-life of these children; but there is distinct mention of a dog—not a detestable barking whelp, but an exemplary creature—one that is silent, thoughtful and courageous, and willing to bite—when that is his duty. This worthy fellow's function was to discourage stupidity. Accordingly, in 1661, just ten days before the arrival of Goffe and Whalley, some ill-natured inhabitant complained of certain "doggs wch bite horses as they passe in the streets, to the endangering of their Riders: Sargent Munsons dogg, -and Thos. Johnsons dogg, was spoken off." Well—some people are hard to please. Sydney Smith says he once heard a man "speak disrespectfully of the equator." Our first father owned lands which he cultivated; but his trade was that of a carpenter. He and Boykin contracted to do a part of the work in building the first meeting-house,—in particular, some work connected with the tower and turret. He and Andrewes built the first bridge over the Quinnipiac. His business was not limited to the New Haven plantation. You should add that his enterprising spirit led him to take a deep practical interest in the project of establishing a colony at Delaware Bay. Though, as a recent writer remarks, "there was a woful shrinkage of estate in those days," though there were pervasive business disasters and impoverishing wars, and though our public-spirited forefather was consumingly devoted to civic and military service, yet, beginning as we suppose empty-handed, he came to be numbered with the wealthy. It is scarcely necessary to say that this man worshiped and served the Almighty Lord, and was for some fortyfive years, a member of the church which assembles under this roof. His burial, in 1685, was on the Green, a few yards from this spot, where Joanna his wife had been interred seven years previously. The grave-stones of both may be seen in the old cemetery. OFFICIAL CAREER AND PUBLIC SERVICES. Turn we now, Mr. President and worthy kinsmen, to the official career and the public services of We give attention to a number of points in his wide and rich experience as a committee-man, and then take up the honorable story of his executive, judicial, legislative and military career. The term committee (pardon this parenthesis) ordinarily indicates a number of men who are appointed by a larger body to examine into some particular matter or manage some specific affair; this one thing done, it ceases. Its limitation is a peculiarity. Munson was appointed by government to appraise property; I have noted ten estates of which he was an appraiser. In 1670 he was member a colonial committee "to set an appraisement upon the land belonging to the several plantations. He was often appointed (with others) to " view " objects and conditions. Thus he viewed' the "way to the Plaines" where a highway was to be located; he viewed3 the Quinnipiac to select a site for a bridge; he inspected the equipment of the cavalry; he inspected the West Bridge4 and the historic Neck Bridge6 which, four years later, afforded refuge to Goffe and Whalley when nearly overtaken by King Charles's emissaries; he inspected the condition of the first meetinghouse eight times within twenty-one years,"—the last time using his influence decisively, it would appear, in favor of building a new house instead of multiplying repairs upon the old. At an uncertain date, " The Townes men Agreed to goe to all the Inhabitance [of the] Towne and farmes to see how the children are educate in reading the word of God: Lievtenant Munson and J Chidsey for the square of the Towne," etc. Munson was appointed (with others) to supervise work for the public: to fence vacant lots ; to construct a chest in the meeting-house "to putt the pikes in to keepe them from warping ; "to mend yc ladder" by which a sentinel on "dayes of publque meeting went up to take his stand upon the meeting-house ;8 to provide a suitable building for "a Colony Schoole (for teaching of latine, Greeke, & Hebrew) to execute an order "that the market place be forth-with cleared & the wood carryed to the watch-howse & there piled for the vse & succour of the watch in cold weather. "2 In 1658 a scheme six years old had become so interesting that Thomas Munson and three others were chosen to consider whether "ye beavour pond brooke can be brought to the Towne, that the mill might be set up here;" this committee reported to another plenipotentiary committee of which Munson was a member, and the bold work was undertaken. In the records there is an abstract of a speech upon this subject by our ancestor, in which he specifies " the great dam," " ye great trench," and the "pen-stocke" of which there is mention twenty years later. This man, who was so rich in the faculty of judgment, was a member of committees to make final determinations. In two or more cases he was chosen as arbiter.3 He was selected (with others) to lay out roads, as "the highway from Woodbury to Pawgasuck [i. e. Derby] to the most convenient place for a ferry;" * and also the conspicuous East Haven thoroughfare, agreeably to this record under date of 1677: "Capt. Munson informed ye Towne, that himselfe Capt. Rosewell & John Cooper senior who was appointed by ye Towne had now stated out and settled a highway from ye ferry unto ye farmes at ye iron works." He was chosen to establish the boundaries of towns. Thus, in 1671, the General Court "appoints Lnt Thomas Munson to runn the depth of the bownds of Brandford and Guilford to the northwards, according to their grant." In 1674 the Lieutenant assisted in establishing the "diuideing bownds" between New Haven and Branford; and in 1675 he was on a committee "to see to the settlement of both the bownds and distribution of lands in the new plantation of Derby. In 1679 "The Town did appoint Mr. Wm Jones, Tho: Munson & John Cooper seneor theyer comittee to state out ye Indians Land on ye east side." purpose when God shall so enlarge the English plantations in Delaware as that they shall grow the greater part of the jurisdiction .... the gouernor may be one yeare in one part and the next yeare in another," &c. Samuel Eaton, Francis Newman and Stephen Goodyear were disposed to have a hand in this high enterprise; but it was presently reported that three ships had "come.to the Sweeds," difficulties loomed up formidably, and the great and superb project took its place with the splendid visions of Dante and Milton. It is time to direct attention to our pioneer's record as an executive officer, elected for lengthened periods of service. The modest though at that time important and respectable position of viewer of fences 1 need not detain us. Our Lieutenant was made plantation-commissary when that office was created at the beginning of King Philip's war. He was chosen treasurer of the town for the unexpired term of Benjamin Linne. Three years he was elected lister or assessor.4 He served as Townsman thirteen years,1 first in 1656 and last in 1683; four years he was at the head of the board. It devolved upon him and his associates to take a census of the Quinnipiac Indians and of the acres of land allotted to them;2 to change the location of the ferry to "the Red Rocke ;"8 to encourage the erection of a village for the inhabitants at Stony River and South End (East Haven);' to resurrect and revivify the Hopkins Grammar School —the Captain, as chief of the Townsmen, making: to consider whether health requires that burials upon The Green should cease,—though it was yet one hundred and thirty-eight years before the place of burial was changed ;' to consider, again, whether the burying place—" about 20 rod square "—ought not to "be fenced about and kept in a comely manner,"—but the matter had hindrance until 1690, when an order was issued that the place of burial "be fencd with a stone wall ... in Ovall forme." As a townsman Capt. Munson was desired (with others) to revise the report of a former committee on the third division of common-land, "and allsoe to endeavor Division.") to purchase from ye Indians such lands as are yet unpurchased." This division took place in 1680; the first and second had occurred in 1640. The call to public meetings—religious, military and civic—during forty-three years, was by a drum beaten in the turret on the meeting-house, and often about some of the streets. The drummer was instructed "to may heare." In 1681, more than two centuries ago, a bell was brought into the harbor,—of which the public records take notice as follows: "Capt. Thomas Munson on of ye townsmen declared ye occasion of this meeting was to Considder ye buysines of ye bell for ye Townes use which was spoken of the last Towne meeting (which meeting was in April last) at which y" Townsmen were desyred to Considder ye matter how ye bell might suit ye Townes occasions and to veiw ye Terrett of ye meeting house, and to make returne to ye Towne of theyer apprehensions in ye Case: Now they had veiwed the sd Terrett and doe judg ye place may be fitted to hang it in for ye use of ye Towne, and allsoe being informed that ye owner of ye bell had sent to have it brought to ye Bay 1 in Joseph Allsups vessell, and that yesayd Joseph had undertaken that ye Bell should yet stay untill another returne, and it having Lyen soe long it would not be hansom for ye Town to put it of, and therefore it wer necessary that now ye Towne would Considder whether they will have it or not and how to raise ye pay for it which will bee fourteen pound in money." It was voted that the bell be purchased, and that the townsmen have it properly hanged for use. In 1678 our Captain had a hand ex officio in the delicate task of seating the Meeting-house. The men were to occupy one side of the house and the women the other, while the assignment of places to individuals was to have (Seating the resPect *o civic dignity, military rank, age, Meeting- wealth, social value, and so on. Mr. Jones House. . . reported that the committee had finished seating the men "and had begun ye seating of women but found some dificulty in that matter." Ah yes,—that beautiful absence of "dificulty" in the seating of men! The report alleged some "want of Roome," with reference to which "Divers desyred that ye women might be seated as farr as seats would reach;" but it was cautiously replied "that ye comittee had some reasons that were not meet to mention at this time." The ex-Deputy-Governor, who had risked his neck to defend Goffe and Whalley against Charles II., was mindful that a bird of the air would repeat every word of the discussion to the Hannahs and Elizabeths and Temperances; and the Townsman and Soldier who had faced Pequots, hostile New Yorkers under Andross, the embattled Dutch, and the terrible conspiracy under King Philip, could not forget that every whisper in the meeting would be telephoned to the "pink and white tyrants" named Joanna and Rebecca and Charity and Prudence; and Jones and Munson resolved upon a masterly discretion. We pass now to Thomas Munson's judicial career. At the age of fifty-one he was elected to the Plantation Court, a tribunal which was convened monthly "to hear and determine inferiour causes,"—if "Civill," "in valew not exceeding twenty Pounds;" if "Criminall,"
Court. when the punishment by scripture Light, exceeds not stocking, and whipping," or "when the fine exceeds not five Pounds." The '"fitt and able men" chosen for this service are styled "the ordinary judges." Those elected in 1662 were "Mr. John Davenport, Jun., Leiutenant John Nash, Ensigne Thomas Munson, and James Bishop." They were all twice re-elected, and they held office until Charles II. united the New Haven and Connecticut colonies. It was not until after the Union that trial by jury was instituted. Lieut. Munson was a member of the first jury impanelled at New Haven,1 and he was its fore First Jury man. This was in October. He was also foreman of the juries in January and February following. In 1666 the Lieutenant was designated as supernumerary Commissioner, to perform duty as a member of the monthly court, in a contingency. Again, our pioneer was a member for many years of the supreme Court of Appeals, in that period, to wit, the General Court for the Jurisdiction,—at first that of New Haven colony, and after the Union, that of ConAppeai°f necticut. One of the six general functions of this high court, in the New Haven colony, was thus stated: "To hear and determine all causes, whether Civil or Criminall, wch by appeal or complaint shall be orderly brought unto them, either from any inferior Court, or from any of the Plantations." In Connecticut colony a similar custom was in force. Let us now advance to contemplate Munson's career as a legislator. General deputy for two sessions of the same body. The next year,—it will be remembered that there was a great deal of contention between the colonies in regard to a union,—Connecticut invited New Haven to send deputies to a General Assembly to be holden on the 15th of March. "After much debate," says the record, "it was thought best to send," and Lieut. Thomas Munson and John Cooper were chosen to represent the community. That meeting of the Assembly was "put by," and a summons to another for April 20th being issued, "the former deputies declaring themselves not willing to goe," there was a new choice, though a minority objected to sending. There is no doubt that the unwritten history connected with these events would be very entertaining if we could recover it. Lieut. Munson was chosen "third man" for the October session of 1665, and he was elected to the same situation in 1668 and 1684. General in which his legislative qualifications were held. It appears, therefore, that he represented New Haven in the colonial legislatures twenty-seven sessions. He was in the Assembly nineteen consecutive sessions, with one exception during King Philip's war when he was engrossed with military duties. The town was represented by two persons each session. During thirteen years, 1669, 1682, there were fifty-six individual elections of deputies, twenty-three of which fell to Munson and thirty-three to seven other men,—the former being elected more times than any three of his competitors,—while in every instance except one he was at the head of the delegation,—evincing his easy preeminence among the sterling citizens who filled this office in his time. Be it observed that legislation in the age of Pioneer Munson was something else than atomizing rose-water. It was the mighty task of sagacious statesmen. Not theirs the vocation to conserve and administer a ready-made system. They had need to be colossal inventors in the sphere of government, for they were founders of new, unique, exemplary institutions. Liberty regulated by law was the beneficent object to be attained. To originate and elaborate a fabric of self-government—an expression of intelligence, wisdom and virtue, and to be maintained by intelligence, wisdom and virtue,—this, conducted in allegiance to the divine government, was the sublime task assumed by the colonial legislators. And this work, you should remark, might not be done at leisure, but amidst diversions and embarrassments springing from other unfriendly and often hostile communities,—the aborigines, the English and again the Dutch of New York, the Rhode Islanders, and we may as well add, (softly,) the English Crown.